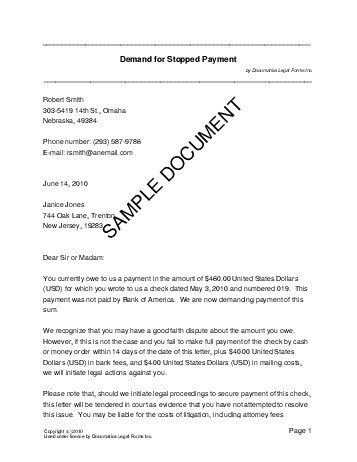 This document is used to demand the payment of sums that were paid by a check which was later stopped or cancelled. If legal action is later initiated to recover the money, this demand letter can serve as evidence in court that the debtor has not attempted to resolve the matter. The Payee is the person/corporation who received the check. Is the Payee a corporation? The Payer is one who wrote the check. Do you wish to specify a name to address the letter to? How many days does the Payer have to pay (e.g. 14)? How much does the Payer have to reimburse for bank fees? How much does the Payer have to reimburse for mailing fees? We strongly recommend obtaining an attorney reviewed Demand for Stopped Payment directly from us.